I have a dresser with a fold out shelf that's a little over waist high. I set it on that and use it standing up. I always use it standing up. I like having the sharpener down low. I seem to be better at keeping my angles consistent on my kitchen table than on my kitchen counter. My computer desk works well for me too. I have heard some say that they like to stand a little back away from it when sharpening. I like to be up on top of it. The idea with either method is to give yourself some space and the right perspective to see if you are vertical or not. After a while you will just develop the muscle memory though and it won't be as important. i got started with the Sharpmaker exclusively but quickly found it to be terribly boring. and depending on the edge condition when you start and steel type, it can take a pretty long time to get to good results. i invested in an edge pro and this helped emmensly in producing excellent results but getting it all out and set up was still more hassle than i wanted so eventually tried splash and go whetstones and found them to be just an excellent mix of quick, easy, fun, and rewarding and now my Sharpmaker and Edge Pro just sit collecting dust. if i could go back, i'd just as rather invest the price i spent on the first things on more whetstones and gotten started learning with them much sooner. i got started with the Sharpmaker exclusively but quickly found it to be terribly boring. and depending on the edge condition when you start and the steel type, it can take a pretty long time to get to good results. 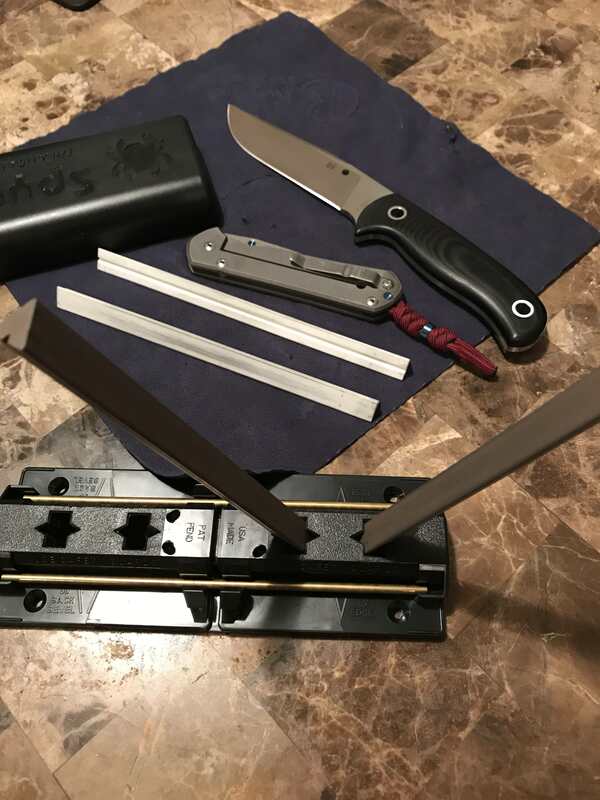 i invested in an edge pro and this helped emmensly in producing excellent results but getting it all out and set up was still more hassle than i wanted so eventually tried splash and go whetstones and found them to be just an excellent mix of quick, easy, fun, and rewarding and now my Sharpmaker and Edge Pro sit collecting dust. if i could go back, i'd just as rather invest the price i spent on the first things on more whetstones and gotten started learning with them much sooner. I only use the Sharpmaker. I started out with Arkansas stones when I was given my first knife. Used them for years until I bought my sharpmaker, 20-ish years ago. It is my most used system. I have a long, fat ceramic f rod as a “steel” for kitchen knives, and a worksharp field sharpener that I got mostly because it has the right size ceramic rods for SE blades. And a little plastic doodad that came with a fillet knife. Works like a champ on the fillet knife, but I don’t use it for anything else. I’m thinking about a double stuff or a medium benchstone for heavier stock removal, but I haven’t really needed it yet. I have one knife I’ve given up reprofiling to 15 degrees per side, a Benchmade 720 in ATS34. That one has such a thick tip, I just sharpen it on the 20 degree SM setting. We’re both happier that way. Everything else gets sharpened on the 15 degree setting. I don’t do microbevels, I find it’s simple enough to do the whole bevel at the same angle; but I also use steels that sharpen readily. My history with s30v is not so rosy, but 154cm, D2, M2, M4, VG10, and hap40 all work marvelously on the SM. Whatever Case and Victorinox uses works fine too. I prefer using the Spyderco Tri-Angle Sharpmaker for the majority of my knife sharpening needs. I can reconfigure it as a bench stone and use any of the Spyderco Tri-Angle Stones, especially the Diamond Stones. However, I have found that sometimes ya just need a really good bench stone of a longer length for some sharpening needs, especially if some serious reprofiling is needed. That, and as cool as the "bench stone" option is with the sharpmaker, it doesn't work with knives that have thick scales. On a lot of my custom fixed blades I can't sharpen the first part of the edge. Before I bought the Spyderco bench stones in comparable grits, I used that feature a lot, but instead of the bottom of the base I'd lay them on the top in the storage slots. You onoy get one stone instead of two to work with, but you can sharpen the full length of the edge with thick handled knives. Just gotta use really light pressure or the stone will move around a bit. I recently bought a sharpmaker and I'm a bit disappointed thus far. I've watched the DVD and various review videos, I just can't get a hair popping edge with it. I never let my knives get dull, so normally I just touch up. 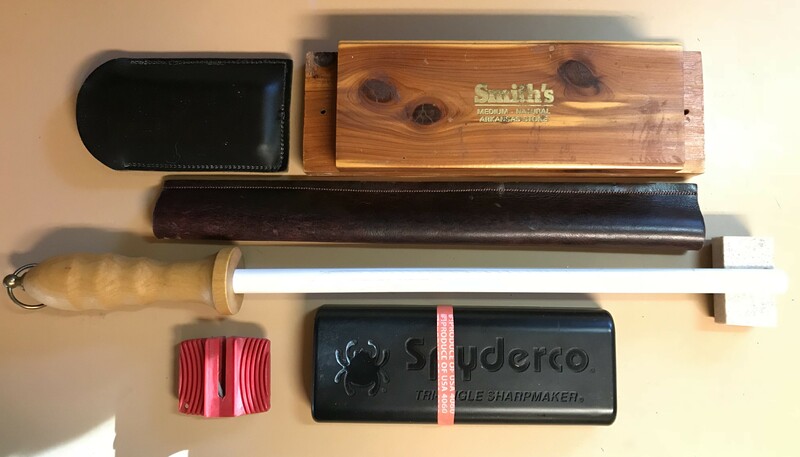 Oddly, before buying the sharpmaker I actually had a sharpmaker fine rod and ultra fine rod that I used to free hand sharpen. I'm actually better at getting the desired edge that way than using the sharpmaker system itself. I wonder if i dont have the technique down yet, or if mine is faulty? The rods don't fit snuggly in the plastic enclosure. When using the flat sides at the 40 degree angle, the flats aren't at a perfect 90 degrees so I'm not sure if I have to keep the knife completely perpendicular to the flat part of the rod, or if i need to slightly angle it to do So? Seems like it catches one of the edges of the triangle when bringing the blade straight down, instead of entirely on the flats. None of my knives have been used enough to require a reprofile, so I a bit stumped here. Any advice? First and foremost...are sure you're hitting the apex? Remember, a Sharpie is your friend. I know everyone has their own technique for getting their desired results but this is basically what I do. I put the medium rods in the base like I'm going to use the flats. Which angle I use depends but for factory bevels I typically use the 40° setting to make sure I'm hitting the apex. Now..holding the blade perpendicular to the table I run the edge down the corners of the rods. I use slow and deliberate strokes. I alternate sides for each stroke until I feel the edge start to come up. I've read where people say they don't bother with the corners because it's a good way to round off the tip. I like using the corners and I feel that the way I do it, with the flats facing inward and slow strokes, minimizes rounding the tip. Once the edge is starting to crisp up I go ahead and use the entire flat part of the stone until the edge feels sticky sharp. I test on receipt or phone book paper until the blade glides through cleanly without snagging. Sometimes, if I want to speed up the process, I'll use up and down strokes. I start by working the edge near the plunge grind, run the blade up and down the stone using short strokes. I draw the handle back slowly until I'm working the tip. I always finish up using slow-light strokes from heel to tip. Lately I've been using mostly the medium rods and maybe a few light finishing strokes on the fine. It just depends on how refined I want the edge. If I want a really refined edge I might do the whole process with the fine and possibly even the ultra-fine stones. I hope you can visualize all that. I could show you a lot easier than I can explain it in text. Choose the angle setting based on what the knife’s bevel already is, unless you want to reprofile/cut the back bevel back to 30 degrees. I’ve found my spydies, most of recent manufacture and all FFG, work in the 30 degree setting. As said many times in this forum, mark the edge with a sharpie so you know where you’re making contact with the stones and adjust your technique from there. Think too of locking your wrist and swinging your elbow to adjust where the edge is hitting the flats of the stones to maximize contact there. With the curved portion of the blade you won’t make contact all the way across the flat. As for points, I always use the triangle points but stop a little short to avoid dragging the tip off the point. Then I can work just on the tip on the flats to get the tip to where the rest of the edge is. It’s a fantastic tool but it does have a learning curve. Appreciate the tips fellas. I'll definitely give these a try. The factory edge bevel angle is ~40 degrees inclusive, correct? Surprised that some people are using the 30 degree setup to maintain factory edges then? Factory edge bevel angle is usually somewhere between 30°- 40° inclusive. Sometimes it's even a little less than 30°. I just touched up my Advocate on the SM and was able to use the 30° setting. The Sharpie on the bevel was only removed right at the apex. I was kind of surprised by that. Factory edge bevel angle usually somewhere between 30°- 40° inclusive. Sometimes it's even a little less than 30°. I just touched up my Advocate on the SM and was able to use the 30° setting. The Sharpie on the bevel was only removed right at the apex. I was kind of surprised by that. Interesting to hear that there can be such a variance. I have only touched up a few of my knives on the SM so far and the 40° seemed to be leaving me with a nice fresh bevel on all of them. I will definitely have to check and confirm with the sharpie though to be sure. I actually tried the Sharpie on the 40° setting, though it was on the fine and ultra fine rods, only 20 passes on each and it just barely took the Sharpie off right at the apex, didn't touch the bevel. Maybe not enough passes to really gauge it, or should have used the brown rods? If it makes any difference, or for those of you with the same knife that may be able to relate, it's BBS Para 3 M390. My DF2, M4 p3, and hap40 Delica all are very happy at 30 degrees. I have one Benchmade that needs the 20 degree position, and once I accepted that it’s a breeze to sharpen. Gave me fits until then. The sharpie marker will tell you what to do!